Make Money Selling Alpha Force Stun Guns! This Starter Package is great for any Retail Store, Swapmeet, and Trade Shows. Easy to sell, low cost, Great Profit Margin! Alpha Force Package Contains $300 Plus in retail Sales. type/brand may change depending on availablity. Make Money Selling Batons. This Starter Package is great for any Retail Store, Swapmeet, and Trade Shows. Baton Package Contains $285 Plus in retail Sales. Make Money Selling Self Defense Items. This Starter Package is great for any Retail Store, Swapmeet, and Trade Shows. Self Defense Package Contains $300 Plus in retail Sales. Make Money Selling OTF Knives. This Starter Package is great for any Retail Store, Swapmeet, and Trade Shows. 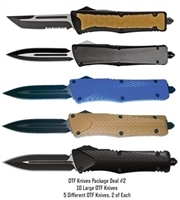 OTF Knives Package Contains $400 Plus in retail Sales. Colors or blade type may change depending on availablity.